Banana Split Poke Cake - Home. Made. Interest. This Banana Split Poke Cake is an easy dessert made with all of the flavors of a banana split with a cherry on top! Banana split sundaes seem to be my official dessert for summer 2016. There could be worse things ;). 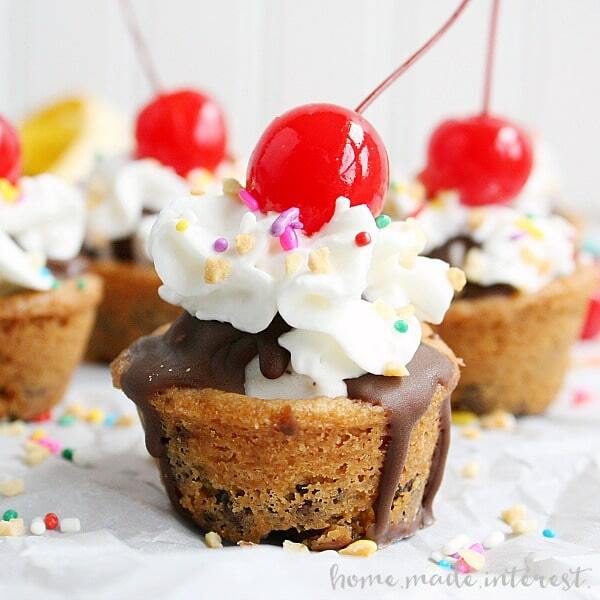 After we made those super adorable Banana Split Cookie Cups a couple of weeks ago I couldn’t get the flavors out of my head. Banana splits are so fun. kids love them. Adults love them. They are topped with whipped cream and a cherry. I mean really, what’s not to like? 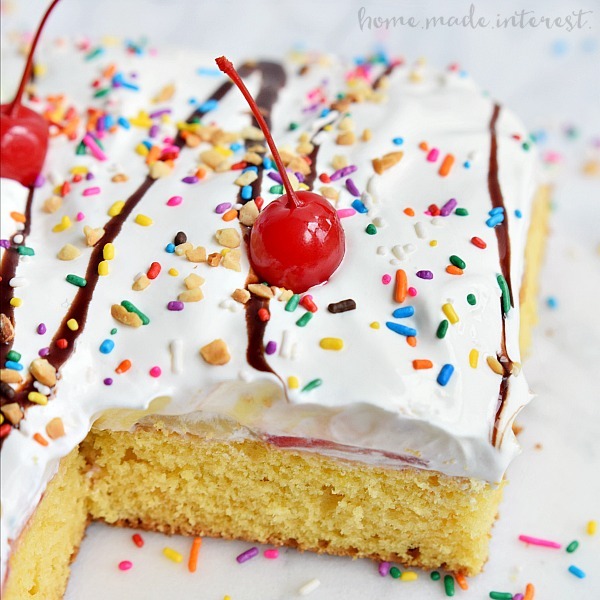 I wanted more easy ways to get all of the banana split flavors into a delicious dessert and one day it dawned on me…poke cake! It’s the obvious answer. A super simple cake that is just dying to be made into a fun summer dessert. Now you can use your favorite cake recipe for the sheet cake but I think poke cakes are all about keeping it simple so I use a boxed cake mix to save myself a little time. Once the cake is cooled you poke holes across the top. I use the end of a wooden spoon and it makes the perfect size holes. Then mix up some vanilla pudding, let it set up in the fridge, then spread it over the top of the cake making sure to get it into all of those holes. Then comes fresh bananas and strawberries. Slice them thinly and then layer them across the top in stripes. The vanilla pudding soaks up the flavor and then seeps into the cake making it super moist. Top the cake with a layer of whipped cream, or Cool Whip then cover it and let it sit in the fridge for at least an hour. That gives all of the flavors time to gel together. When you’re ready to serve it drizzle with chocolate sauce, sprinkle with rainbow jimmies, and of course some cherries on top. It’s so pretty, so easy, and totally yum! Seriously no one in your house is going to be able to resist this cake. I think it would be perfect for a kids birthday party and I’ve already served it at a summer BBQ (there were no leftovers!). 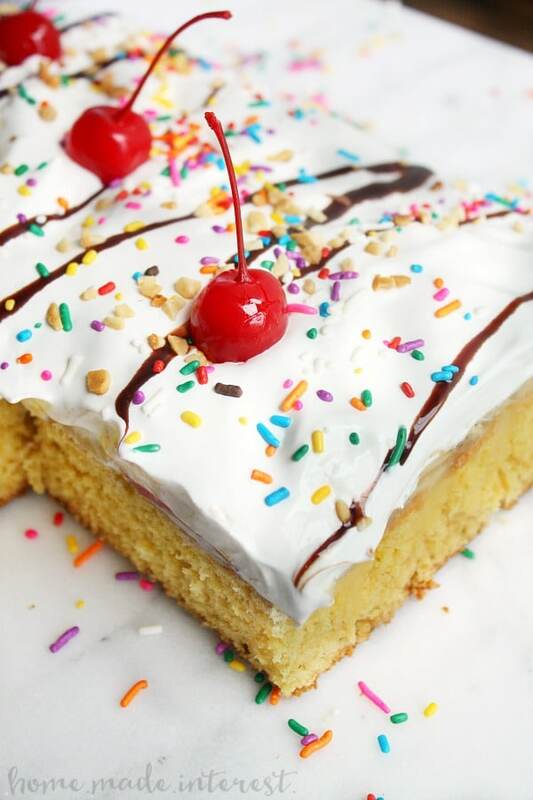 All the flavors of a banana split in a poke cake recipe! Bananas, strawberries, and vanilla pudding covered in whipped cream, chocolate sauce and of course sprinkles with a cherry on top! Bake the cake according to package instructions in a 13" x 9" pan. While cake bakes make the pudding adding 2 cups of milk to the contents of the pudding box, whisking it together and then placing the pudding in the fridge to firm up. Spread the vanilla pudding over the cake making sure it gets in all of the holes. Once the time has passed remove the cake from the refrigerator and place the slices strawberries and bananas on the cake in alternating rows. Then spread the whipped topping over the cake. Drizzle chocolate sauce and sprinkle jimmies over the cake and then finish it off with cherries on top. « Previous Post36 Things I cannot live without! wow looks amazing! so cheerful too. thanks for sharing on craft schooling Sunday! Cakes with fruit are always a fave of my mine! Will this be fine in a refrigerator for a day or two if I make in advance? Yes, I would just do it a day ahead but even 2 will be ok. This looks delicious and I am making it for a church potluck later today. I did notice that your instructions do not mention putting the bananas and strawberries on the cake. Thanks Nikki I updated the recipe. I hope everyone enjoys it! Looks yummy-but where’s the pineapple? That’s my favorite part of the banana split. Wonder if it could be added under the bananas and strawberries or on top. I bet this could make it even better! Sondra- great idea. 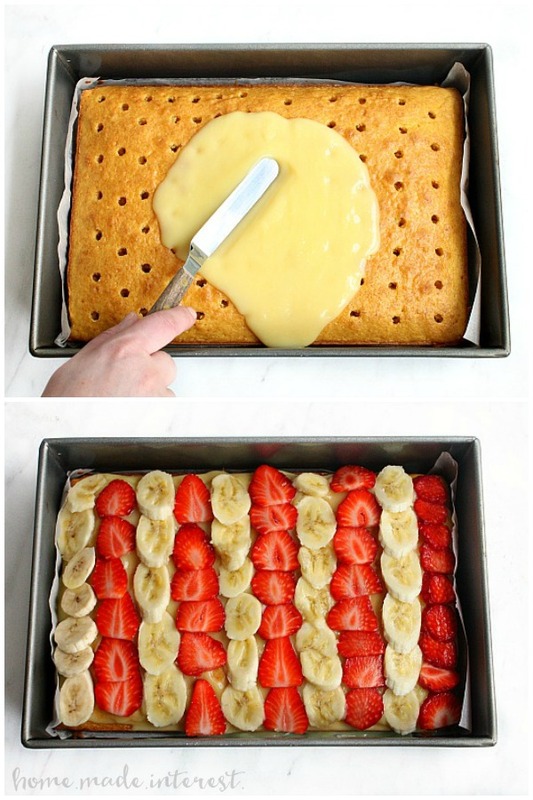 I think I’ll try this yummy cake by using banana pudding and topping with pineapple bits and strawberries! So pretty and delicious looking. I think I will try it with banana pudding. Thanks!